This is for one set of 4 pcs PrintPayLess® brand, Pre-filled Refillable Ink Cartridges for HP 950/ 950XL & HP 951 (non-OEM), and additional 400ml UV resistant dye ink specially formulated for HP printer. They are Brand new, manufacturer sealed. The refillable ink cartridges are pre-filled with dye ink, and come with chips. The chips can be recognized by the printer so you can reuse them after refilling the cartridges. 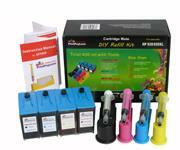 The pre-made refill holes make refilling ink cartridges incredible easy! Further more, The semi-transparent, spongeless cartridges give you a direct view of the actual ink level. 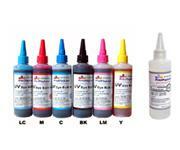 You can use our specially designed sprout mouth ink bottles or syringe to refill the ink. Please note: These cartridges won't work in the printers manufactured after March of 2015 or the printers with the latest firmware. Color type: Black, Magenta, Yellow, Cyan. Ink type: UV resistant dye ink; Specially formulated for HP. Special Design: Semi-transparent, spongeless cartridges give you a direct view of the actual ink level. High Quality: Manufactured by ISO 9001 Certified Factory. Premium Ink: Specially formulated for HP cartridges and printers; not universal ink. 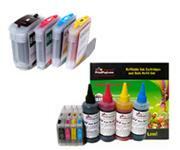 Save Cost: You can save up to 90% cost, comparing with buying OEM ink. Easy Refill: Pre-made Refill holes and our specially designed ink bottles make refill Supper EASY, NO MESS! Eco-Friendly: Reduce carbon dioxide production! Saving energy, resources, and Saving the Earth! Officejet Pro: 251dw, 276dw, 8100 - N811a, 8600, 8600 - N911a, 8600 Plus, 8600 Plus - N911g, 8600 Plus - N911n, 8600 Premium, 8600 Premium - N911n, 8610, 8620, 8630. Orders usually are shipped out within 1 business day after the payment is received. We ship to a confirmed address only; and tracking number is available. Our goal is to exceed your expectation. We provide 30 days money back guarantee. Click the button below to add the Combo 4 PK Pre-filled Refillable Cartridges for HP 950 / HP 950XL(Non-OEM) HP 951 with Chips + 400ml UV Resistant Ink to your wish list.